In ARCHN, I sought to explain how a woman of Rand's obvious intelligence could have adopted and propagated so many notions, ideas, and principles that are at odds with the basic facts of the human condition. Rand's tabula rasa view of human nature, her sociologically naive view of history, her rationalistic metaphysics, and her essentialistic, speculative epistemology can hardly be accounted for on the basis of innocent errors. Rand was smart enough to know better. So how did she fool herself in believing that most of the problems of the modern world stem from the failure of philosophers like Descartes and Locke to solve the problem of universals or that human beings are self-creators? She did it by using philosophy to rationalize her preconceived notions about human nature. Objectivism has special pleading written all over it. But what, specifically, was Rand pleading for? Well, Rand herself claimed that all her writing was motivated by the desire to project her view of the ideal man. 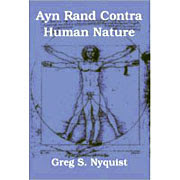 It is from this romantic conception of human nature, which Rand fashioned, not from her experience of men, but merely from her own fantasies and wishful thinking, that leads her to the absurdity of the "ideal" man who, although born with no personality or character, nevertheless experiences no difficulty in creating his own self ex nihilio, merely through "rational" thinking. Philosophers down through the centuries have inflicted the human race with all kinds of absurdities, many of them as far removed from common sense and reality as one could possibly imagine. But few of these absurdities can equal the whopper that Rand bequeathed to the world. Because human beings have free will, Rand argued, this means that man can shape “his soul in the image of his moral ideal, in the image of . . . the rational being he is born able to create.” Rand never provided even the tiniest shred of compelling empirical evidence for this view. It was true because she said it was true, and that is supposed to be good enough for the rest of us. This is what a woman who prided herself on being rational and adhering to reality resorts to whenever she wants to believe in something that doesn't correspond to the facts. And this is how she begins her Objectivist system: with a colossal falsehood which she tenaciously throws into the very face of reality. We find ourselves in the presence of a philosopher who not only doesn't give a fig about the truth, but who is ignorant of the most basic requirements of intellectual honesty.